This sleek contemporary matte black dome top humidor possesses a unique set of visual characteristics that make this piece entirely unique. The Portofino is Spanish cedar lined and includes a removable tray with an adjustable divider on top and a second adjustable divider with humidifier slot & humidifier in its lower section. 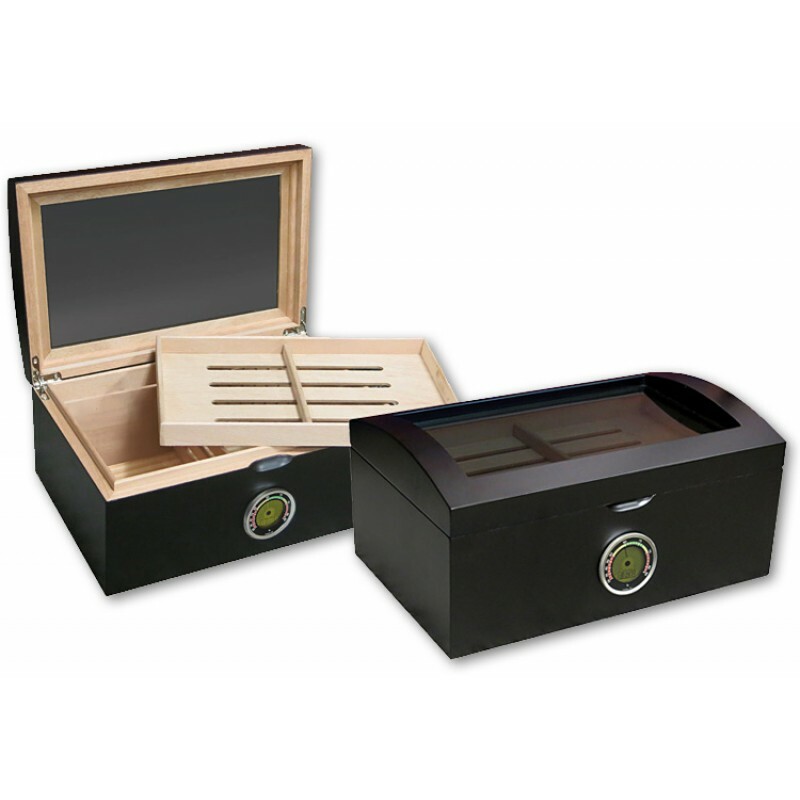 This 100 count cigar humidor features polished silver hardware throughout and a black recessed lid finger pull. 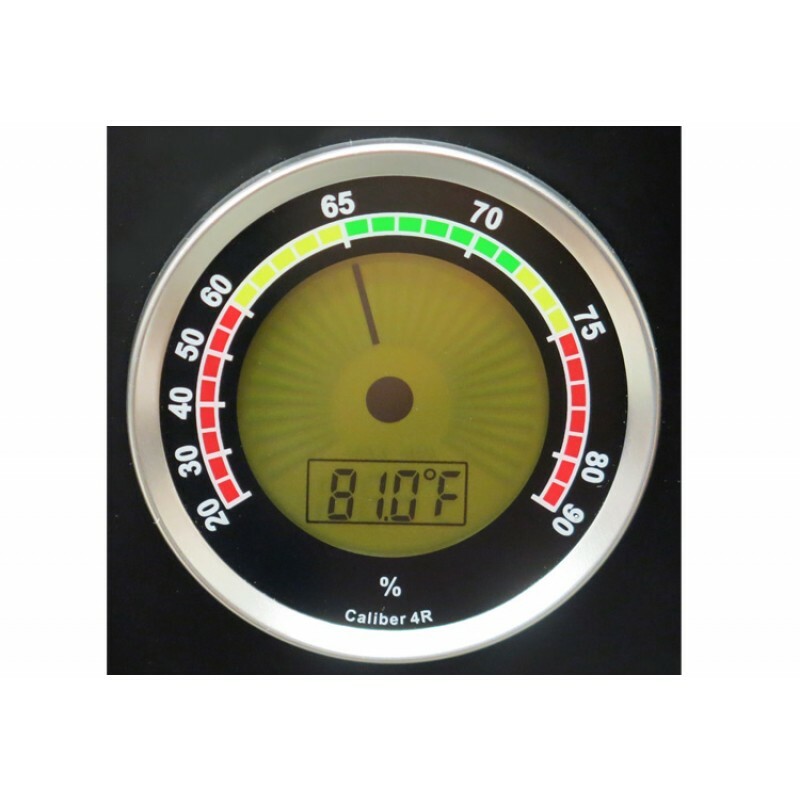 One of its most notable attributes is its state of the art external Caliber 4r digital analog hygrometer. 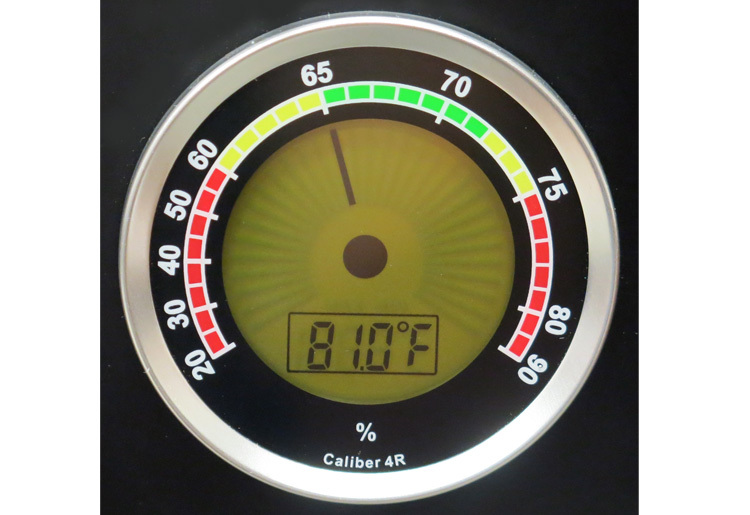 Relative humidity and temperature in Celsius or Fahrenheit are indicated in an easy to read multicolored numeric display. Includes a battery and built-in calibration feature so its ready to use right out of the box. 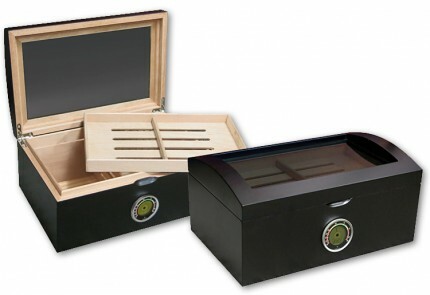 A stylish and remarkable humidor with a fantastic collection of features at a great price. I’ve only had smaller analog humidors in the past. I specifically was looking for one with a external digital hygrometer and temp gauge. I hate having to open them to check the gauges. And good looking at the same time. This will be my 3rd humidor. The 1st two are small 25/Ct units. Right out of the box this Portofino looks the part. My previous humidirs came w/analog hygrometers and those things are only accurate twice a year. So this one comes with a pre-calubrated digital! I am still seasoning mine so no word yet on hygrometers accuracy, I will double check it agsinst a calibrated one after its ready. I purchased this humidor (with the assistance of Kaili) for my fiancee. Plus, I had several questions afterwards and she was so helpful ! Thank you Kaili !! .... he's loves it !! Got tired of talking and thinking about smoking cigars apparently my wife did as well because she got me the Portofino for Christmas! I live in Florida so even this time of year it's somewhat humid. I followed the break-in instructions and found it's better, for now, to leave the humidifier out and still maintain a RH of 70-72%. It's a nice adornment next to my new wine cooler and can't wait to fill it with more fine cigars.